When it comes to audio, the words “Bluetooth” and “portable” usually are indicators of a less-than-ideal music experience. 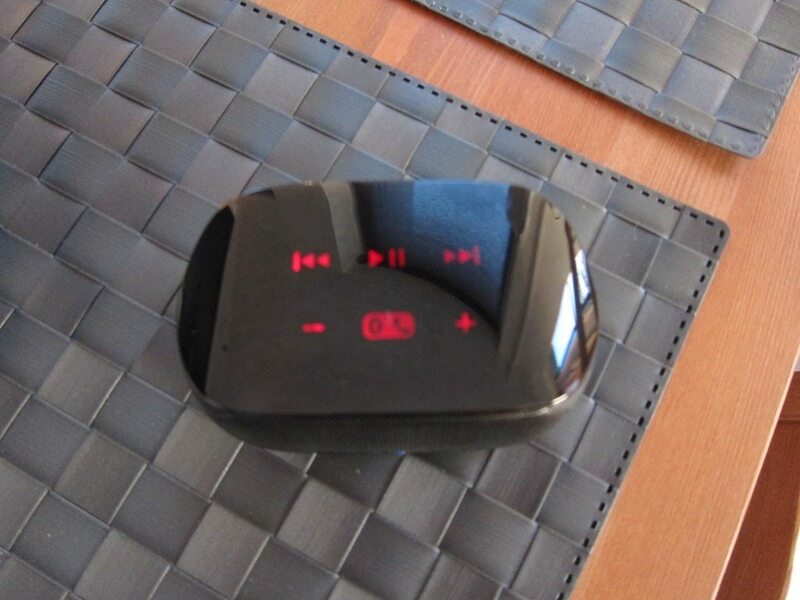 Despite the many advantages of Bluetooth, in terms of audio it usually means poor audio performance. The same can be sad about truly portable speakers. 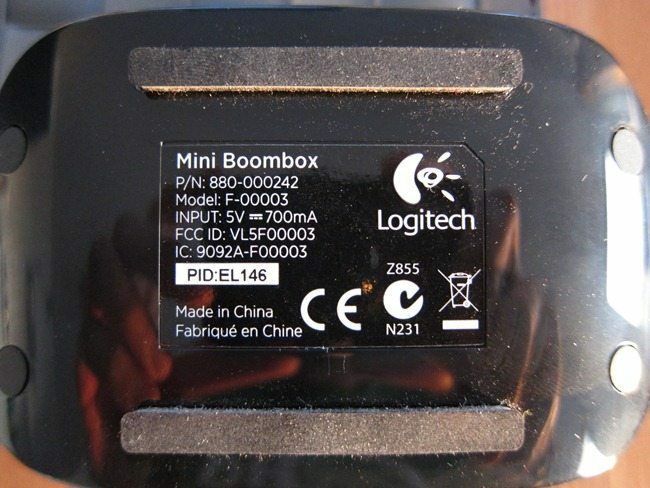 So when a package arrived with the Logitech Mini Boombox, that’s exactly what came to mind. While this speaker is incredibly small, it’s mainly due to the small size that tinny sound and unreliable wireless performance also come to mind. 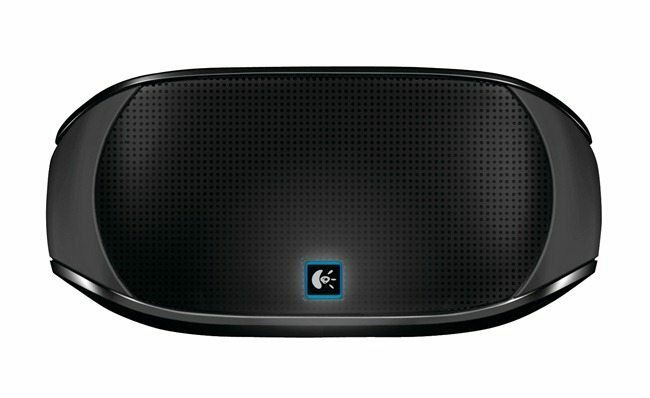 Logitech is known for their almost perfect execution of computers peripherals and speakers. Can they do the same for the wireless portable speaker formula? 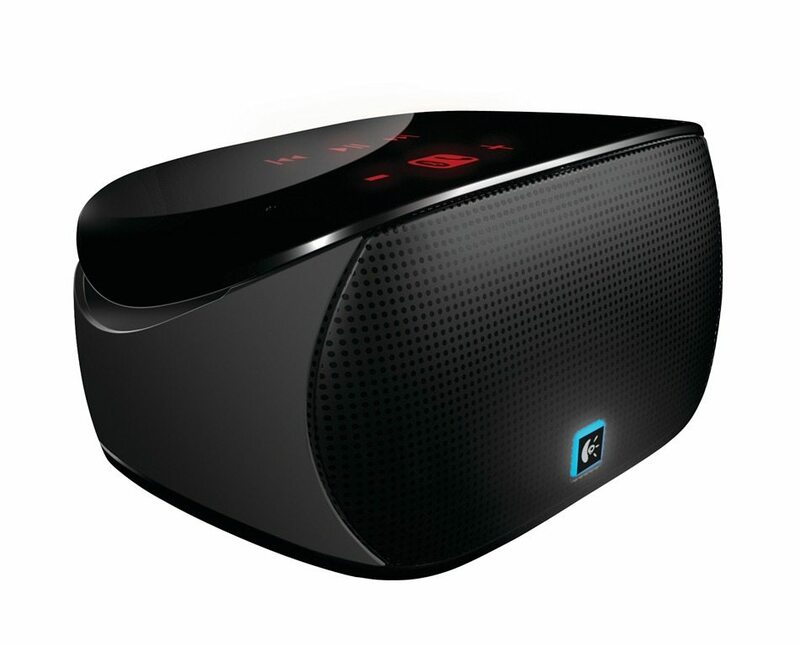 The Logitech Mini Boombox is actually two devices in one: a wireless portable speaker and speakerphone with built-in mic. This gives the device potential to be integrated into at-home or business phone systems. 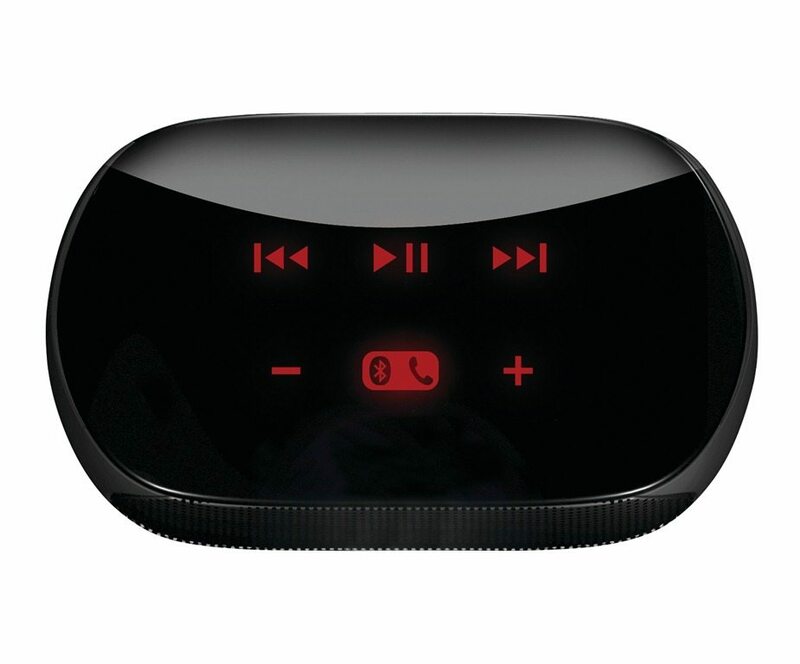 Through the magic of Bluetooth v2.1, it’s not only able to receive stereo audio from just about any Bluetooth enabled device, but this also allows it in combination with the capacitive buttons to control your music on for example your smartphone or laptop. However it goes one step beyond other wireless speakers by incorporating a microphone, making it one handy little speaker that can also be used for voice calls and even VOIP services like Skype. 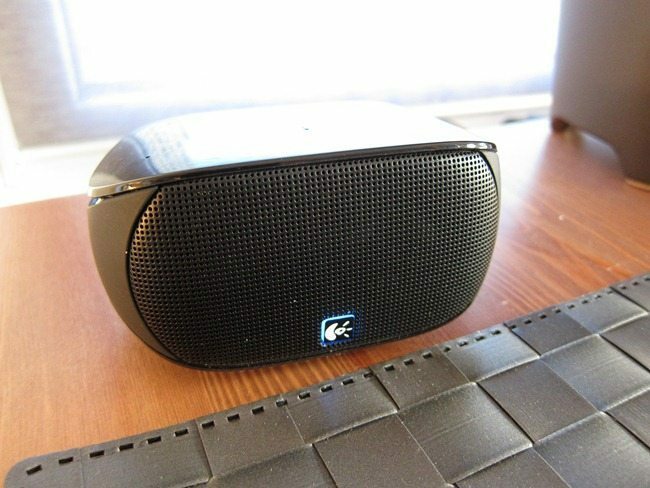 As the name “Mini Boombox” implies, this is can be considered the “mini” version of Logitech’s much larger and more expensive 8-driver Boombox wireless speaker. The Mini Boombox can also be seen as an alternative and in some ways a better version of Logitech’s own Wireless Speaker and its Z515 variant. While they both share the same $99 price, the Mini Boombox adds a mic, capacitive controls and is much smaller in size which should make it the more portable of the two. The Z515 on the other hand does use a pair of larger 2” drivers (instead of the Mini’s Boombox 2×1.3” drivers) which on paper at least should allow it to sound a bit better. 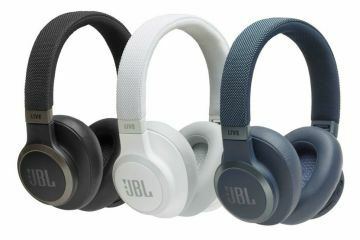 This is supported by the Z515’s frequency response numbers of 122Hz-20 KHz which is slightly better when compared to the Mini’s 200Hz – 15KHz. 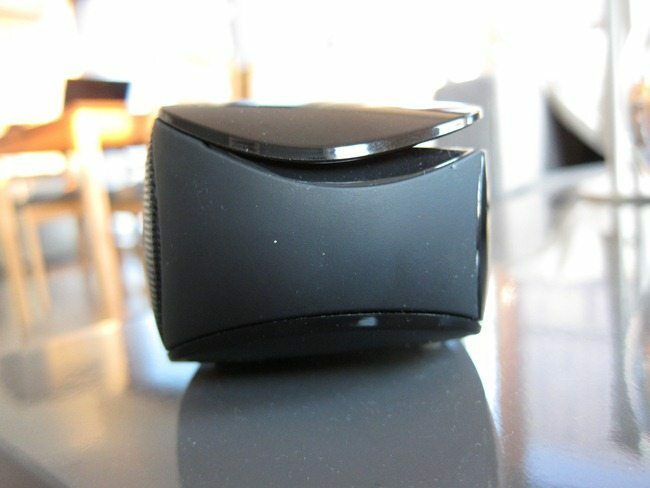 However Logitech is using a specially designed acoustic chamber on the Mini which in practice closes the gap even more and makes for an impressive little speaker (More on this in the performance section). Strangely Logitech has decided to give the much smaller Mini Boombox with it’s smaller drivers 6 Watts of total power, while the much larger Z515 gets the half at just 3 Watts. As you might know, the amount of RMS power isn’t indicative of a speaker’s performance, but I did expect the Mini to get equal or less power than the larger Z515. I was lucky enough to listen to the Z515 some time ago and indeed it’s ahead of the Mini when it comes to performance, but judging by the Mini’s size you’d expect a night and day difference, right? Logitech seemed to have done some nice tweaks on the Mini to make the difference less dramatic and less than one would expect. 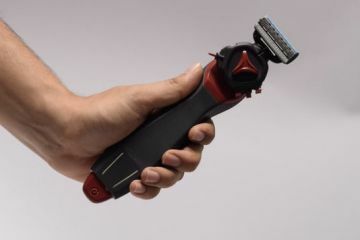 The Z515 also has a longer wireless range of 50 Feet or 15 Meters versus the Mini’s 30 feet or 10 meters, but in terms of wireless performance this difference is negligible. The Mini is available in 3 colors: Black, Red and White, but Logitech has decided to tastefully keep the top part in Black, but making the front mesh grille White on the White version. 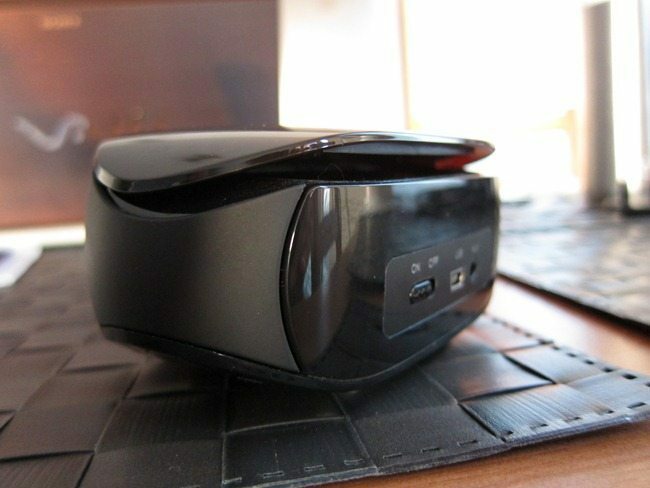 The Black model is widely available, some online stores carry the Red version while at the time of writing, the White version can’t even be found on Logitech’s own online store. Considering the price, I expected a little bit more than the bare essentials included the package. Basically, all that’s include is the USB charging cable and power adapter. Even the much bigger Z515 came with a carrying case, so it’s a mystery to me as to why they didn’t do the same for the Mini. Considering the small size and the portability factor, you’d think that having a case would rate high on a list of accessories that you’d want to include. The fact that the glossy top part is prone to scratches there’s even more reason to include a case for a speaker that’s expected to go anywhere and everywhere. I would love to see a hard cases, perhaps with a small soft handle that can fold flat. 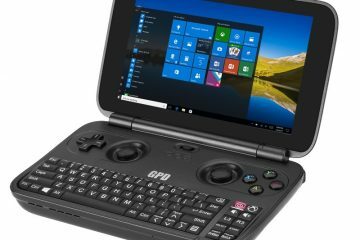 Hopefully Logitech will include one with future versions of the Mini, but for the current model this is one of it’s biggest downsides. Also missing from the package is a 3.5mm audio cable. Not as essential as the case, but including one would have been handy. Logitech seems to be implementing a new design language on the Mini Boombox that still has some similar elements of the recently introduced wireless Boombox, but makes the much older Z515 look dated. I really like the direction they’re taking things: modern,very understated with attention to detail. My Black Mini seemed to blend in with my home décor and in combination with the big sound, visitors don’t initially spot where the sound is coming from, looking around for a much larger speaker. After they can’t find anything, there’s usually a short silence followed by the question: “Where is the sound coming from?.” Upon closer inspection it becomes clear that that the design is all about rounded corners, oval shapes and surfaces that beautifully flow into each other. When using any type of lights on electronic devices, there’s always the risk of making it look a bit too flashy, which is the the case with many gaming peripherals. Logitech has done what I can only call a perfect execution when it comes to the lights. They were not only able to make them useful but actually adding to the overall look of the speakers. 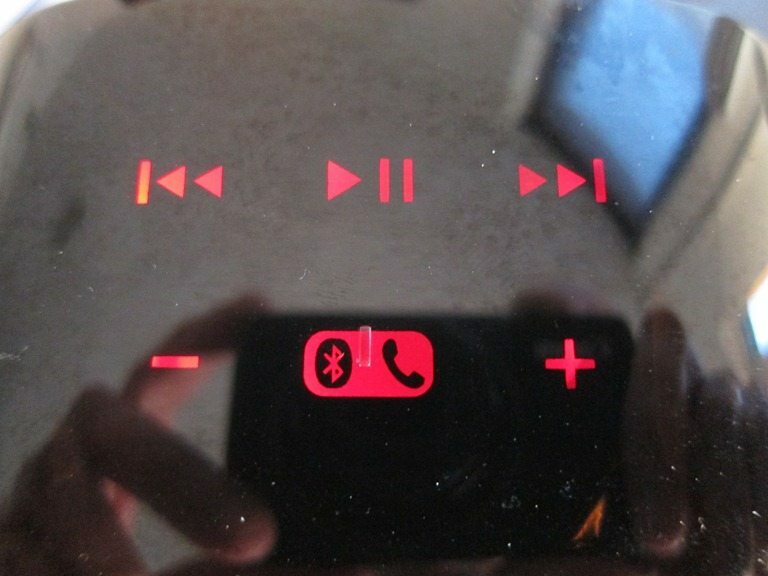 Especially the Red capacitive buttons on top look really good, are modern and functional. 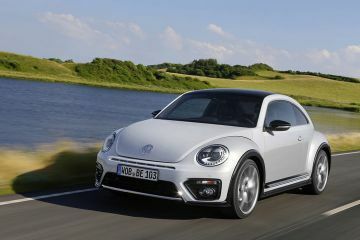 The front is dominated by a large Black metal speaker grille that’s permanently attached to the body. It matches the same long oval shape that’s found on the back, top and bottom. The metal is tough enough to provide plenty of protection for the two tiny speaker cones, even in the case of a fall. It’s safe to say that in the event of an accidental drop from a very high place, the body is more likely to break or get scratched up than the two cones damaged. The speaker grille has very small holes, making it actually very difficult to see these cones, unless the lights comes in from very specific angles. 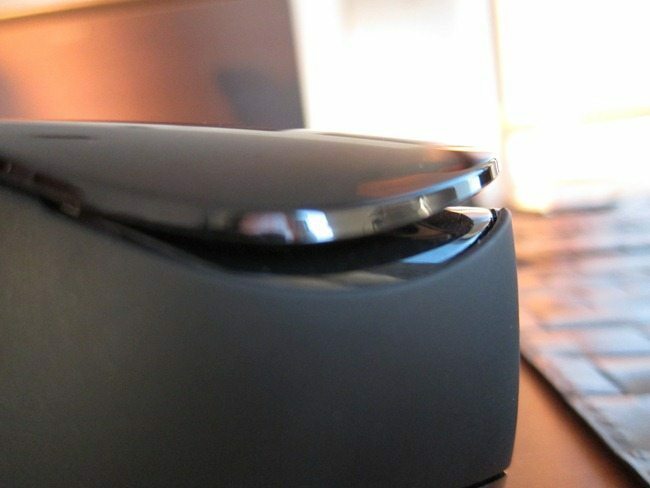 The Logitech logo is placed at the bottom of the grille where it’s surrounded by a multi-color status indicator light. A very nice touch and subtle enough for it not to become flashy. 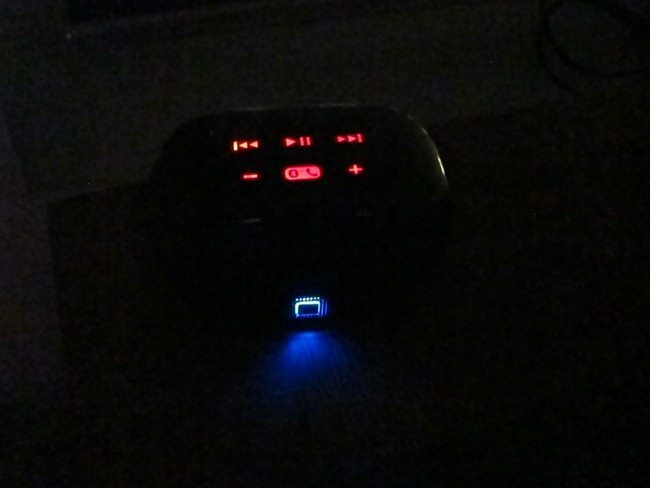 It turns solid Blue when turned On, solid Red when the battery is low, flashing Red means very slow battery, slowly flashing Blue when charging and quickly changes between Red and Blue when in pairing mode. The sides are done in a matte, almost rubbery looking plastic. A wise decision as the material adds quite a bit of grip, preventing the tiny speaker from slipping out of your hand. Both the top and bottom parts nicely flow beyond the edges towards the sides, creating some kind of sandwich that widens in front. 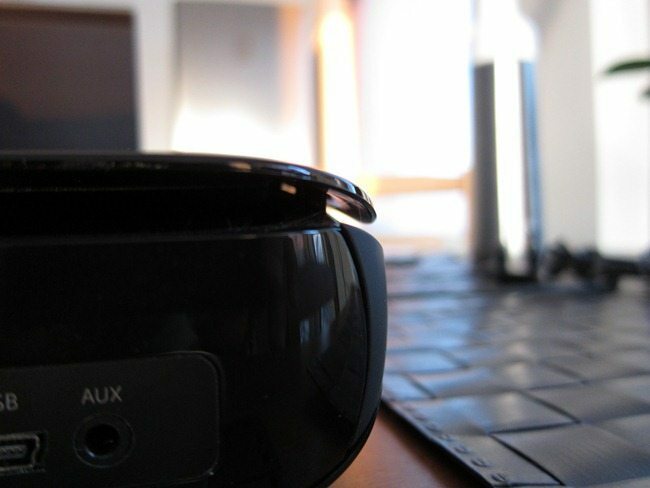 When seen from the side the speaker slightly tilts upwards, widens and gets narrow on the back. As expected the back continues the oval shape, but is unnecessarily done in a glossy finish. 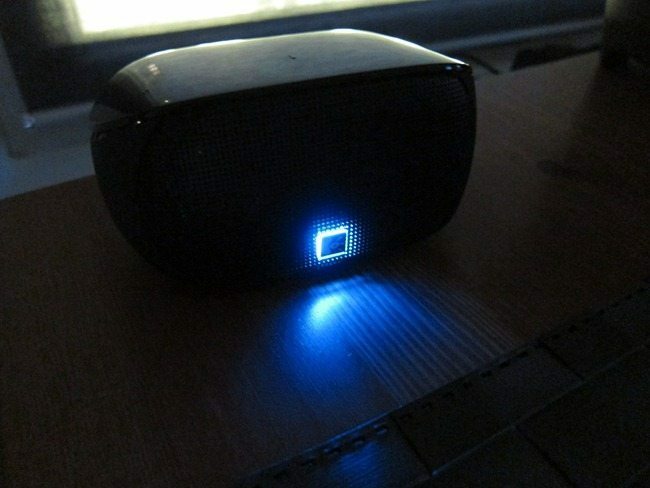 How many times will you actually be even looking at the back of a speaker? When turning it On, I just reach around the back without even looking. My Philosophy about this is simple: glossy surfaces look nice, but should be avoided when necessary and a speaker with a glossy back perhaps is too much of a good thing. Especially one that’s portable and expected to be thrown around in bags, put on rocks and bumped and hit against lot’s of stuff. On the back there’s a strip that houses the power buttons, Mini USB charging port and Aux-in jack. Worth noting is the fact that the Mini USB port is for charging only. At first I thought about the possibility of using the USB port for both charging and audio delivery, but this would add unnecessary cost and complexity, especially for a device that’s mostly expected to be used wirelessly. 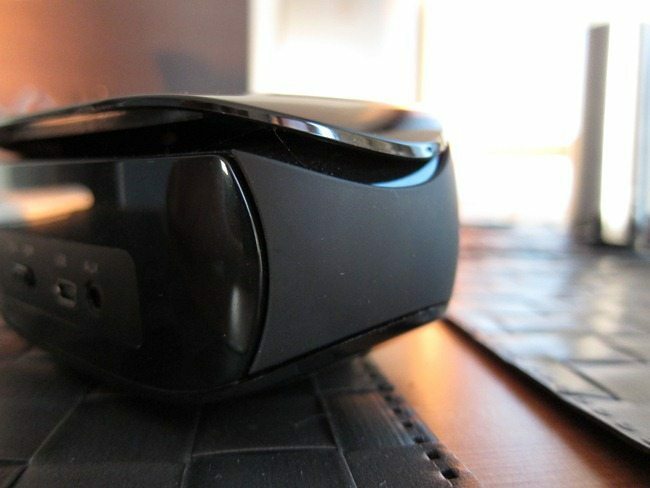 In my opinion Logitech made a wise decision not to include this feature. 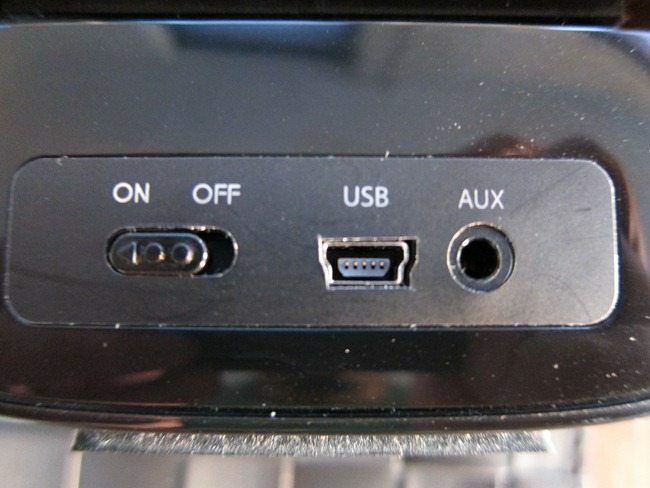 One area of concern is the fact that that the cut-outs for the USB and Aux-in aren’t precisely cut, with a less than perfect result. This is something you really have to look very closely to see it and isn’t something that affects the overall look or performance. 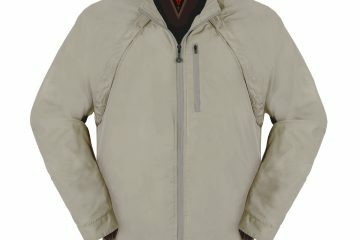 Nevertheless it negative point for a product where the overall fit and finish is very good. Definitely not something we normally see from Logitech. 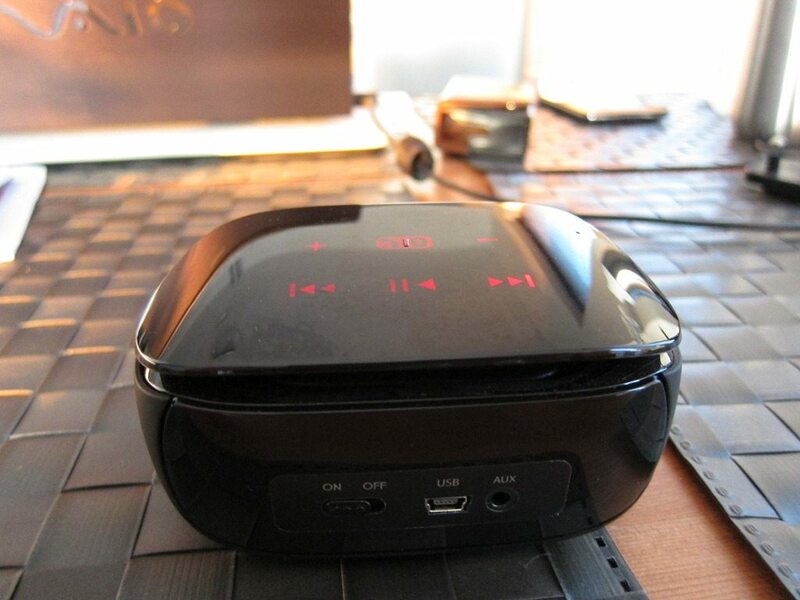 On the back you’ll notice a large opening, which basically is the secret behind the Mini Boombox’s big sound. A look inside reveals a fairly larger passive radar, in fact larger than the two active speakers in front combined. Logitech loves ported speaker designs as is evident by their many computers speakers, but probably due to size constraints they went for a passive radiator on the Mini Boombox. The advantages are clear: enhanced bass and louder volumes from an extremely tiny package. 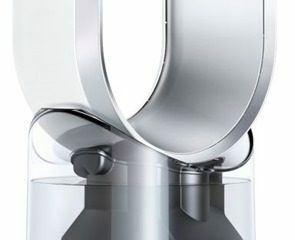 The radiator sits slightly sunken into the body facing upwards in a hollow “chamber” that gradually opens and widens, sort of like megaphone neatly tucked into the back of the speakers. When Logitech talks about “A specially designed acoustic chamber” I think they’re referring to this combination of both the passive radiator and chamber. 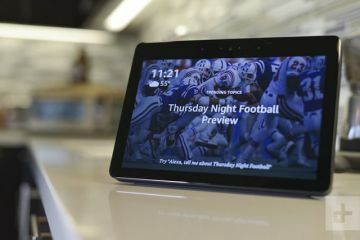 The pièce de résistance has to be the top part that houses the backlit, capacitive touch panel controls. It’s one Black piece of glossy plastic with Red backlit keys. 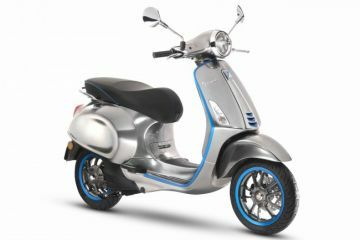 The result looks amazing and futuristic and unlike what most would think, it doesn’t sacrifice too much practicality for sleek design. The backlit keys actually turn off after a period of inactivity, leaving no trace of them ever being there. Surprisingly, the keys are quite visible in day light and only under very bright day light it can become difficult to see the buttons. To activate the backlit keys, you have to touch a raised piece of plastic and all keys suddenly come to life. The keys are separated and large enough that there’s never any accidental key presses. The bottom part again is all about glossy plastics and two vertical strips of rubber that should keep the Mini Boombox in place. Fact is, that at max volume, the entire unit vibrates and starts to slowly move. This is something that affects even speakers and subwoofers costing hundreds or thousands of dollars, so not something against the Mini. It can be alleviated by making the unit more heavy, but that would defeat the purpose of such a light and portable speaker. Thankfully this only happens to at max and close to max volume. I have noticed that it’s just a matter of placing it at the edge of a table while playing at very loud volumes. Perhaps Logitech could alleviate this even more by placing the speaker cones at opposite ends, a technique known to reduce vibration. Even better would be a 360° design where three cones are placed in a circle. When I first turned the Mini Boombox On, it automatically entered pairing mode, with the status light quickly flashing Red and Blue. The pairing process is similar to other Bluetooth devices, so there aren’t any surprises here. To pair with more devices you’ll need to hold the Pair/Phone button for about 15 seconds and the device will re-enter pairing mode. It quickly connected to my Samsung Galaxy Note and had no problem maintaining a solid connection. In fact it was able to keep going without any breaks in the audio, even at longer distances, indicating an extremely good wireless range. As you get farther away from the source, there is a slight pause in the audio(less than one second). Perhaps this indicates the wireless radios increasing their power to maintain a strong signal, but after this slight pause, it continues without any problems. One negative side is that when it does loose connection, it beeps twice, but sadly isn’t smart enough to automatically reconnect like certain types of Bluetooth devices. It’s also not able to connect to two devices at the same time. The wireless range is impressive though, so luckily this isn’t something you’ll have to deal with very often. I wasn’t expected much from this small system with its two tiny 1.3” speakers. To give you an idea of just how small these speakers are, all you need to know is that some full-size speaker actually use 1.3” or larger tweeters. 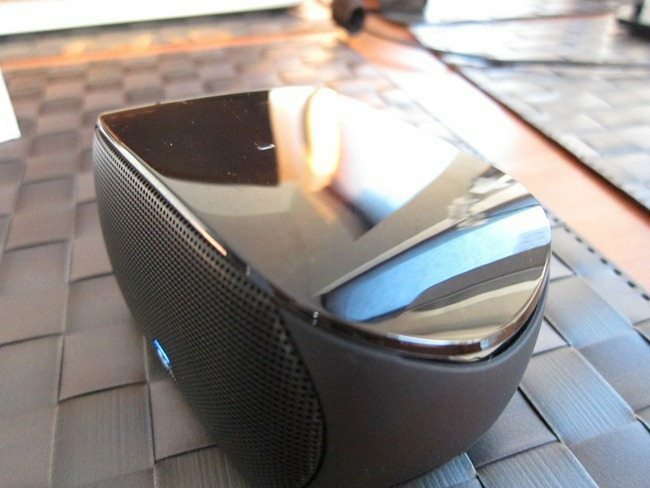 To bring the system size down, Logitech needed to use tweeter sized speakers! But don’t let that fool you. The sound that comes from the system is quite impressive considering its size, in fact I was blown away. Not only where they louder than I expected, but they actually can get really loud. The system also impresses by producing an overall immersive and rich performance that seems to defy the proportions of all the tiny components. The system handles highs beautifully so a separate tweeter isn’t necessary. It does an admirable job with the mids and mid-bass, which are good indications of how beneficial the passive radiator and chamber combo is. I do think that sound can be improved by using just just one (and larger) speaker. From something this small you’d expect bass to be none-existent, but’s it’s there, just enough to make for one impressive performance. It adds just enough base to add depth. Obviously there are songs which require a speaker to dig deep and as expected, the Mini Boombox simply isn’t capable: it digs as deep as it can, but simply falls apart or doesn’t register the lower tones. At max volumes the Mini Boombox is able to keep its composure, unless it’s a very bass heavy song, where there’s it’s clearly audible that the speaker is working at full load and forcing to keep up. One thing is for sure, most will be impressed with the overall sound. I definitely was. As for VOIP and voice calls, it does an admirable job with loud volumes and accurate representation of voices. The mic is also quite sensitive. I don’t have exact numbers on the size of the battery, but from my usage with volume between 65 to 80% of max volume, I got close to 10 hours of usage. Despite the use of USB to charge, the speaker seemed to charge quite fast in 30 to 45 minutes. Useful isn’t a term you’d usually use for speakers, but in this case that’s exactly the word I would use. Not only was I able to add music to rooms where I didn’t have speakers, but there’s something simply cool about being able to control the music with my smartphone or tablet. Sometimes I like to relax with ambient nature sounds while reading a book and with the Mini Boombox it’s just a matter of placing the speaker somewhere and using an app on my smartphone to blast an entire room with sounds. Than I could move on to podcasts or just use it as a speakerphone when connected to my laptop or using it instead of my laptop speakers which aren’t really the loudest. It’s one of those rare devices that becomes even more useful as you use it. 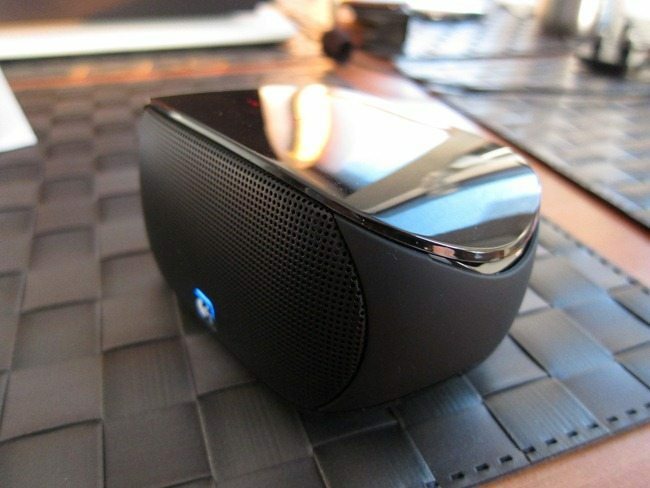 The Logitech Mini Boombox is one impressive little speakers. It differs from your standard wireless Bluetooth speaker with its capacitive, backlit touch controls and it goes one step beyond by incorporating a microphone. This makes it ideal for VOIP and voice calls. Considering the price, I expected a little bit more than the bare essentials included the package. It’s a mystery to me as to why they didn’t include a case. Also missing from the package is a 3.5mm audio cable. Typical of what you’d expect from Logitech, the product is all about great modern design, especially aided by the understated lights and capacitive buttons. I loved the used of the rubber materials for the side panels and the design looks great with it’s glossy parts. But for a device that’s expected to be portable and get scratched, I’d say there’s too much use of glossy materials. Logitech’s “acoustic chamber” seems to be combination of both a passive radiator and chamber. The results are impressive, even with the use of two tiny 1.3” drivers, a size you’d typically use for tweeters. The sound that comes from the system is quite impressive considering its size, in fact I was blown away. Not only where they louder than I expected, but they actually can get really loud. The system also impresses by producing an overall immersive and rich performance that seems to defy the proportions of all the tiny components. Just don’t expect deep bass, but just enough to add depth. Some might be annoyed with the fact that speakers moves across a flat surface when playing a max volumes.The Mini also shined as a speaker phone and excelled with a stable and long wireless range. If Logitech manages to add some accessories and do something about the cut-out holes, we’d definitely increase the score. But for now, it get’s a good 8.8 out of 10. Very useful: can easily moved to different rooms or connected to different devices with different uses. Hi your write up was very useful…I just got one today.but the sales rep told me the battery cannot be replace and can only be recharge but I was presently surprise to read from you that it indeed can be replace. Can you please advise how is it done. Thank you.